A few months ago my television suddenly conked out. Actually, it wasn’t so sudden. For a few days a wide vertical stripe had been appearing over the picture. It would go away if you turned the set off and on again, but eventually it stuck around permanently. Since I wasn’t going to live without a TV (can you imagine???) I dragged myself to Best Buy for a replacement. I considered a 3D-capable set but after trying a demo I just wasn’t digging it so I went with the model I had already planned on. This is the first time I’ve had some regret over that decision, because I’ve never seen Dial M for Murder as it was intended, in 3D. Oh, you can try to imagine the effect, but it isn’t the same. Still, I’ve heard mixed reports concerning how much the effect adds in this film, so maybe I’m not missing much. No matter how many dimensions you watch the movie in, the script is still dynamite. Dial M is a film that usually gets high marks (it holds a spot in the IMDb top 250, anyway) but doesn’t get spoken of in the same lofty tones as Rear Window, Vertigo, Psycho, North by Northwest or Notorious. Or heck, even Marnie. It’s not a very distinctive movie: the stagebound production isn’t impressive, it doesn’t sport much in the way of inventive cinematography, it doesn’t have a great Herrmann score (although Tiomkin’s is perfectly fine), it isn’t loaded with psychosexual undertones or grandiose themes. But man, do I love how it unfolds. The intricate planning of the murder, the intricate improvising when it goes south, the intricate unravelling of the scheme. 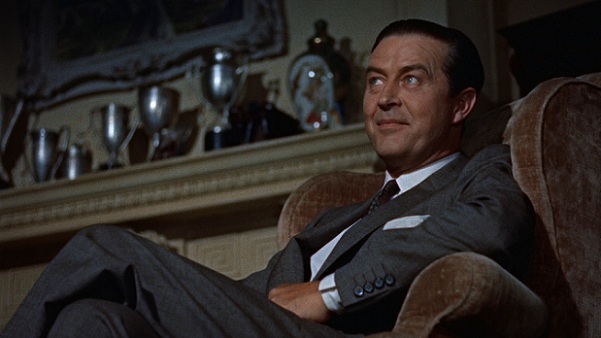 Grace Kelly doesn’t often get overshadowed, but Ray Milland and John Williams are the true highlights, it’s a joy to watch them sparring in a battle of wits that neither of them can be sure the other is aware of (the less said about Robert Cummings, the better… one of Hitchcock’s weakest leading men). This entry was posted on October 14, 2012 at 12:29 am	and is filed under Movie Reviews. You can follow any responses to this entry through the RSS 2.0 feed. You can leave a response, or trackback from your own site.